Meeting with Lord Eidaru of the city of Samon takes up the entirety of Act 1. The party is given a mission to infiltrate some local rebels and put a stop to any would-be insurrection with the working class. Act 2 opens things up for the PCs to decide where to go and what to do to earn favor towards getting a meeting with the Fangs. 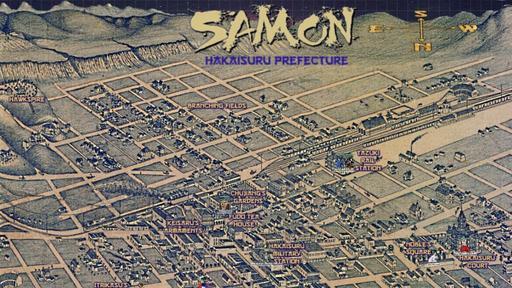 The city map of Samon easily points out the notable areas that PCs can travel to, including tokens placed directly on the map. The goal is to acquire ‘Favor Points’ from each area, with the rebels making initial contact upon reaching three points. Unfortunately almost all of these areas boil down to simply chatting with people and making skill checks. There are a few neat events listed and detailed, like sabotaging a railway or following one of the many named NPCs through the streets, but none of them have any maps. Oddly the only location in Act 2 with a map is a tavern that’s almost entirely inconsequential to the main plot. The PCs simply get thrown out if they ask about the rebels, yet we get a full battle map with dynamic lighting and tokens. Act 3 is a big warzone in a garden between multiple factions, with our PCs caught in the middle. Their actions here determine the course for Act 4 as they can choose to help the rebels or the empire. It’s a neat moment story-wise but the adventure doesn’t put any of the tokens on the battle map, and it’s daunting to try and figure out who’s where. Whatever the PCs end up doing, the insurrection happens in Act 4 and the city is gripped by chaos. The PCs’ goals have shifted to stopping an evil ritual by a group of serpentine shapeshifters holed up the basement of a building. The basement level is given a huge amount of interesting things to interact with and possible ways to approach, but the actual map is hideous and largely empty. The story structure is more reminiscent of Shadowrun than D&D, which I find refreshing. It’s longer than a one-shot but nearly as big a scope as Lost Mine of Phandelver. There’s too many named NPCs to keep track of for the size of the adventure, but what I found especially egregious were the empty maps. If you’re selling a module directly on the Roll20 marketplace, I expect ready-to-play maps and tokens, and “Mists of Akuma: Fangs of Revenge” fails that basic test completely. The Tazuki Rail Basement has a of detail and interesting things to work with (though the actual map is hideous and empty). Combat Sheets provide a nice at-a-glance reminder of things PCs can do during combat. Tokens aren’t correctly linked to character sheets when dragging. Only one of the battle maps have tokens set up. Way too many named characters for how relatively short and small the adventure is. 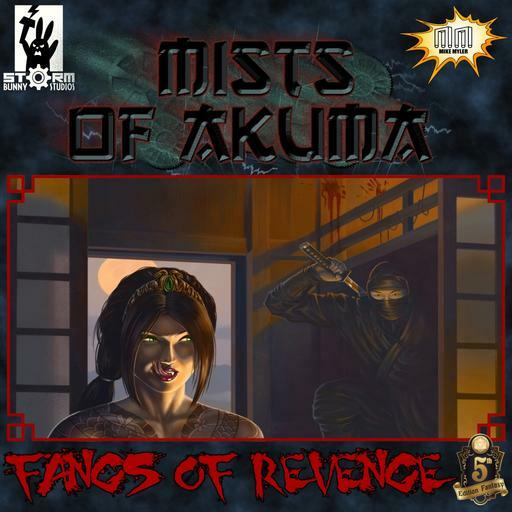 The Verdict: The far East setting amid a world of ANTHROPOMORPHIC SHapeshifters is intriguing, but “Mists of Akuma: fangs of Revenge” Suffers from basic Roll20 map and token errors.